Technica Cochise 95, Women's boot, size 24/24.5. Boots used one season. Great all mountain boot with tour/hike mode. Overall good condition. $250. Looking for all-mountain performance that's ready to hike to out-of-bounds stashes or bootpack up the ridge to the resort's most distant corners? 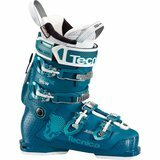 Check out Tecnica's Cochise 95 Women's Ski Boot, which fuses a friendly 95 flex and comfortable 100mm last with a Cuff Mobility System ski/hike mode that gives you a large range of motion in the ankle for a free and comfortable stride. The shell's constructed out of ultralight Triax 3.0 plastic, and its dimpled C.A.S. design quickens heating and punching for bootfitters. A boot is only as good as its liner, though, which is why Tecnica outfitted the Cochise 95 with a snug and warm women's UltraFit liner that provides an awesome out-of-the-box fit and can be heat-molded to perfectly fit the contours of your foot. The Cochise also has a pre-punched navicular area to accommodate your foot bones and a defined heel pocket to lock down ladies' heels so you don't slip around when you're bouncing through moguls or surfing your way through the trees. A Quick Instep system uses a flexible panel over the forefoot to make the Cochise super easy to take on and off, and the boot also comes with the option to swap out the included alpine DIN soles for tech soles, if you're planning on spending most of your time in the backcountry.